Lester Young & Charlie Parker, 72 hour, Birthdays Celebration! Begins Monday, August 27th! Beginning August 27, WKCR will have a three-day festival dedicated to the music of Lester Young, and Charlie Parker. The 27th marks the birthday of tenor saxophonist Lester Young, and the 29th, Bird’s. On August 28th we will shift midday to the second artist of this 72 hour jazz broadcast. Early in Lester Young’s career, he spent time in Kansas City, making huge connections as a sideman in bands. In 1933, Young left Walter Page’s Blue Devils, and went to play with King Oliver, Fletcher Henderson, Coleman Hawkins, and Count Basie. Young played in Basie’s band, but would leave for Henderson’s as a temporary replacement for Coleman Hawkins. Young was not a harmonious fit in Henderson’s band, and left after several months. Young spent time with Andy Kirk, and assisting other bands between Kansas City, and Minnesota. In the early 1940’s, Young played in Los Angeles with his brother, Lee Young, and toured with the USO. Young rejoined Basie’s band in 1944 which gained him brief popular recognition before being drafted into the army. Young returned to existing as a musician in 1945, but addiction deteriorated the frequency, and consistency of his recordings. Until his death in 1959, Young occasionally played with Jazz at the Philharmonic, developed his sound within bebop, and recorded through Europe. 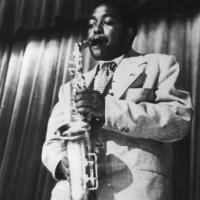 Charlie Parker knew Kansas City as his hometown, and joined Jay MchShann’s Orchestra in 1937 when still a teenager. Bird is a founder of bebop, and perhaps the most dynamic saxophone player of all time. During the early 1940’s, Parker spent time in New York playing with Dizzy Gillespie, Earl Hines, and Billy Eckstine. Beginning 1945, following the recording strike, Parker and Gillespie were prolific in writing striking compositions such as Anthropology, and Groovin’ High. Gillespie, and Parker worked in Los Angeles, selling out nightclubs, and concerts. In 1947, Parker formed a quintet as leader in New York which featured Miles Davis, Duke Jordan, Tommy Potter, and Max Roach. Parker continued to record, and toured Europe despite difficulty with his cabaret license, and drug-abuse. Parker tragically died at the age of 34, but his influence in Jazz, and his virtuosity as a musician is unparalleled. Join WKCR in celebrating two men who were intellectuals of their music. Tune in at midnight on Sunday, August 26 to 89.9 FM, on iTunes under College radio, or stream RealAudio from our website.